I have read this part of the bible and the first thing I thought about was Leonidas in the Zack Snyder movie, 300. I will be first to admit this movie isn’t the most Christian thing to watch but I love a good action flick. This story is about Leonidas and his 300 Spartans fighting Persians to free themselves from their tyrannical ruling. Leonidas believed he only needed true warriors to fight by his side and that his three hundred men was a match for any army. With great strategy and skill he felt he could take on the strongest force in the land. This leads me to another greater warrior of the bible named, Gideon. One of the many judges. Gideon had many soldiers under his command. Many more than Leonidas originally and his goal was to bring the land back to our God. However there was one voracious tribe that stood in the way. The group that caused much of the problems was the Midianites. God wanted to make sure that when the Midianites were defeated it was not because of Gideon’s charisma or the size of the Army but the size of our God. So how did Gideon decrease his army from ten thousand to a mere three hundred? Gideon did what he always did, he followed God’s direction. God asked him to separate the men based on how they drank the water. The men drank the water in either two ways: they drank the water by dipping their hands in the water and bring it up to their mouths or they knelt down and drank the water by drinking like an animal and putting their face into the water. Can you guess which one God said the keep? God told Gideon to keep the former. I believe it was because that those men were more cautious and was able to see more of their surroundings. Those 300 men were ready and didn’t bring their guard down. The one thing I can say that say much about the glory of God. 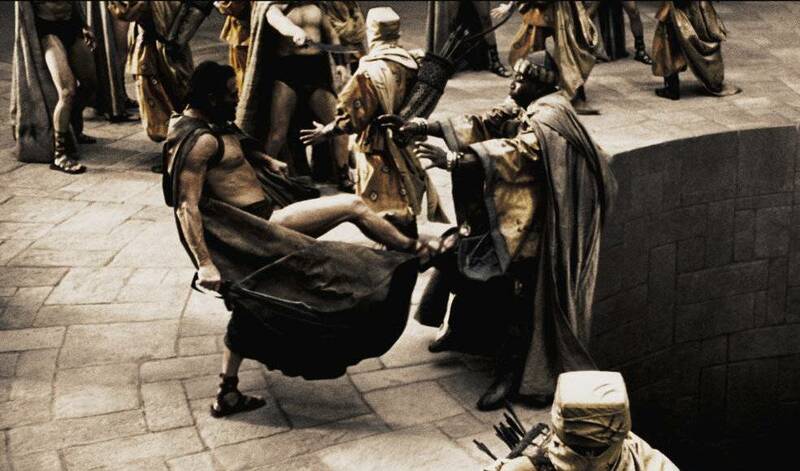 The 300 Spartans all died at the end of the movie. However, Gideon’s army decimated the Midianites with his 300 men broken into three smaller companies of 100 following again a strategy that God have given him. (Judges 7:13-25) The strategy was to lift torches and to yell, “For the LORD and Gideon!” and break jars. God caused the settling armies in the valley to panic and attack each other. This gave Gideon the opening he needed to defeat the armies with his 300 men. What can we say what we learned from this? God’s plan never fails even if we don’t understand it. God may have a plan for your life right now. A plan that might even sound insane to you once you hear it but I promise you that if you listen to Him and follow His will for your life you will not falter but succeed. The road may not always be easy or clear but that shouldn’t stop you from moving forward with his plan for you. Never forget to give God the glory because when it’s all said and done the people watching your success will know it was Him that got you there. Heavenly Father, thank you for having a plan for my life. I promise that I will trust you and your will for my life. I know you that you will never do anything for my harm but only for my good. I may not always understand why you have me do what you need me to do but I know it’s for your greater purpose. Just like Gideon defeat of the Midianites my success will only add to your glory and all who observes will know. They will know it was not my intelligence, strength, or skill but your grace and mercy that got me through. In Jesus name, Amen. I LOVE this one. AWESOME !! !